Wowowowow I just read an article that hit the hammer on the nail to all the things I’ve been contemplating since Azariah was born. I am 100% sure I don’t want Azariah having social media ANYTHING. Children (including teens) just don’t have the means to fully process and understand the idea behind it. I mean, even as an adult, I sometimes can’t separate life here from the life happening right in front of me. Not only that, setting privacy restrictions only protects people from seeing your child, not your child seeing others! And man, there is a lot of mess and madness out there in the virtual world, so easily accessible within a matter of a couple clicks. What kind of ideas will they form about life when they see me scrolling through my feed, posting photos that show off a cute outfit, or results of a workout, or the “cool” places we go just to show off to everyone else..? And even if I put an age restriction on my child and allow them to use it when they turn 16 or so...does anyone else feel weird about using it themselves but telling their children they can’t? Like, how am I to say, “You’re not allowed, but it’s okay for mom”? Even if they aren’t allowed to have it till they’re 16, they will still see me using it. What kind of ideas will they form about life when they see me scrolling through my feed, posting photos that show off a cute outfit, or results of a workout, or the “cool” places we go just to show off to everyone else (“because if you didn’t gram it, did it really even happen??”)? They’re going to generate their own answers- they’ll think that mom believes what's important is clothing, being skinny, and getting approval from other people. I mean, I know this sounds a little extreme. But is it, really? I urge you to read this article. And if what I’m saying is ruffling your feathers a little, first stop and ask yourself why? Because my heart isn’t to shame anyone, if anything I’m shaming myself for being so on the fence and not able to make up a good clear solution for myself. 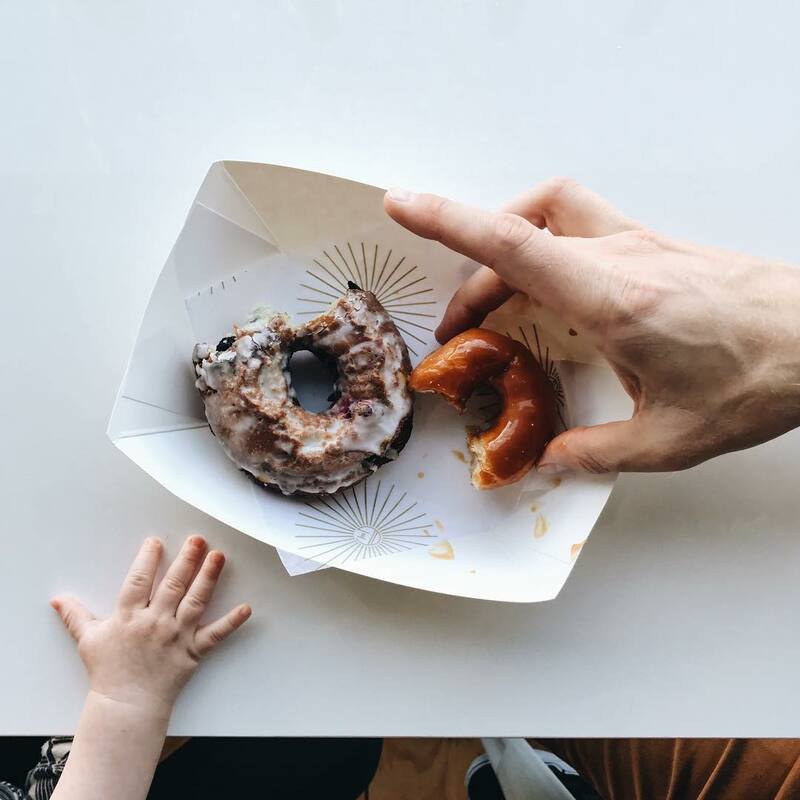 I love that little tiny hand in this photo reaching for my donut. I don’t want his answers to what matters in life, and what he should worry and care about, to come from social media and other people’s likes and approvals.